Celtics guard Jaylen Brown (7) seems unlikely to play Thursday night. WALTHAM, Mass. 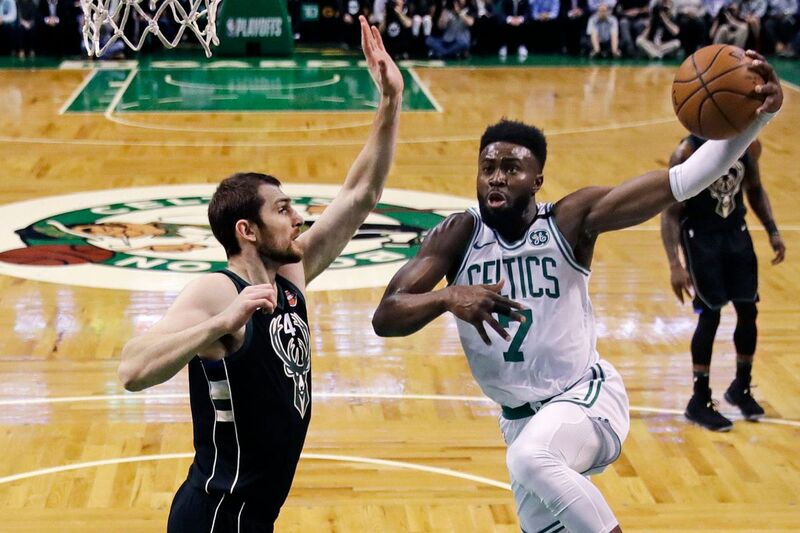 — After a light workout morning to evaluate the status of his right hamstring strain and a few shooting drills, Celtics forward Jaylen Brown seemed unlikely to play in Game 2 at Boston on Thursday night. "He just went through a running progression," coach Brad Stevens said Thursday morning. "He did not go through any of practice yesterday. We'll see if he's able to go through any of walk-through, and if he is, he'll be a game-time decision." Brown participated in shoot-around, then went through and extensive pre-game prep session. He was upgraded to "probable" about 30 minutes before tip-off. The morning tests, conducted as Stevens and general manager Danny Ainge looked on, measured Brown's speed, ability to spin, ability to change direction, lateral movement and ability to use and avoid screens, Stevens said. When Brown does play, he will face the Sixers' wing players, who extensively use multiple screens. Brown is the Celtics' leading scorer, but they won Game 1 on Monday without him. If he does play Thursday night, he will not start. "We'll go with the same five, regardless," said Stevens, who started Marcus Smart in Brown's place. Stevens said he is unsure of how much he would be able to use Brown in any event. Brown has not played since he injured the hamstring Saturday in Game 7 of the Celtics' first-round win over the Bucks. The Celtics built a decent lead late in the second quarter of Game 1, so they never felt they needed to abandon the Sixers' three-point shooters to double-team all-star center Joel Embiid, who finished with 31 points and hit 12 of 21 field goals. "Embiid is going to score points on anyone in one-on-one scenarios," Stevens said. "It's a pick-your-poison. [Monday] night, it was easier not to send two [defenders] because we were up 12. Those two's don't hurt you as bad as those threes would have. It doesn't mean you're always going to make that decision." The cushion let the Celtics keep it simple. "We didn't have to go into other plans we had for that game," said forward Al Horford, and that should continue to work, he said repeatedly, "as long as we're out there communicating. The reason I keep stressing that is they have a lot of guys who are really crafty, just really good players that know how to play without the ball. The Sixers made just 5 of their 26 three-pointers in Game 1. Marco Belinelli, Ersan Ilyasova, Dario Saric, Robert Covington and Justin Anderson combined to go 1 for 14. Asked if he was trying to anticipate any adjustments the Sixers might make from Game 1, Stevens replied, "Sure. They didn't feel like they guarded as well, or they want to get their shooters better looks. You're looking for what those tweaks could be. They have a lot of options with regard to different lineups, different personnel they could play. They're very athletic, very skilled." He paused, and continued, "You can make yourself mad thinking about that." The Celtics needed seven games to beat the Bucks, which meant that, after Game 1 on Monday, they had played three games in five days. "We're really benefiting from this extra day," said Horford, who is 31.